The East of England regional AAA screening group held a successful networking and CPD event at Cambridge University Hospitals NHS Foundation Trust. 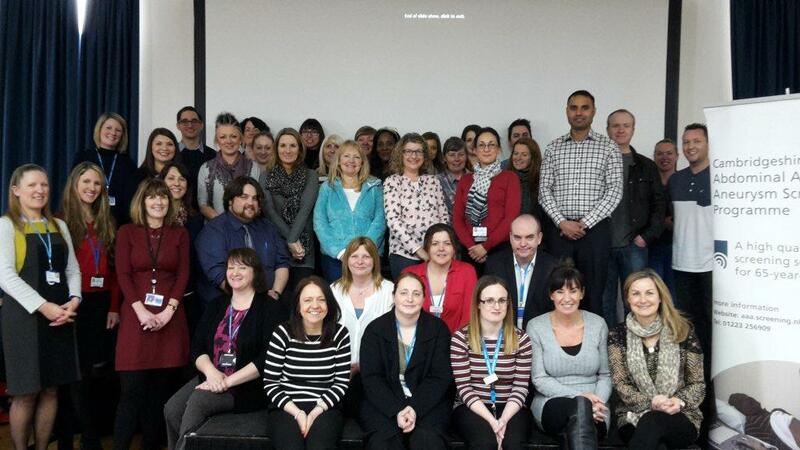 The inaugural regional event was attended by staff involved in all aspects of the AAA screening pathway – programme managers/co-ordinators, screening technicians, programme administrators, clinical skills trainers (CSTs) and vascular nurse specialists – as well as the regional screening quality assurance service (SQAS) team. The screening staff represented 7 local programmes – Cambridgeshire, Essex, Five Rivers, Hertfordshire, Norfolk and Waveney, Northamptonshire and North East London. The day was a great success with staff coming together to work across boundaries and share ideas. The event also incorporated a team CPD session and there is already talk of it becoming an annual event due to the positive feedback. During the morning session, QA Lead Claire Robinson gave a presentation on the hot topic of peer review and Patrick Rankin, national training and education lead, presented an overview of the new training model. Patrick led the afternoon CPD session for screening staff, CSTs and nurses. The rest of the group met with Claire Robinson to review local polices and pathways. This enabled programmes to share best practice and discuss common themes. The event finished with an informal session to discuss how each local programme promotes AAA screening and what new and innovative ways could help to raise the profile of AAA screening in the region. This generated plenty of discussion and excellent ideas which teams were keen to start putting into practice. Raising awareness via social media, sports clubs, supermarkets and retired forces newsletters were among the ideas put forward.